The Thanksgiving holiday can be a tough time to keep everyone entertained. The kids are on break from school, the college students are home for the week, and your family’s visiting from out of state — and everyone’s bored. Thanksgiving can mean a whole lotta people with a whole lotta time on their hands leading up to the big day. If you’re looking for something to do (or something to keep your family out of your hair) this week, there are several options for fun in Durango during Thanksgiving week. The Polar Express: Based on the popular children’s book, the Durango and Silverton railroad‘s “The Polar Express” train ride is a holiday experience for the whole family. This week, the Polar Express train chugs out of the station Nov. 27, 29, 30 and Dec. 1 (and continues through Jan. 4). The Durango train doesn’t run on Thanksgiving Day. The Animas Museum in Durango’s historic school building. 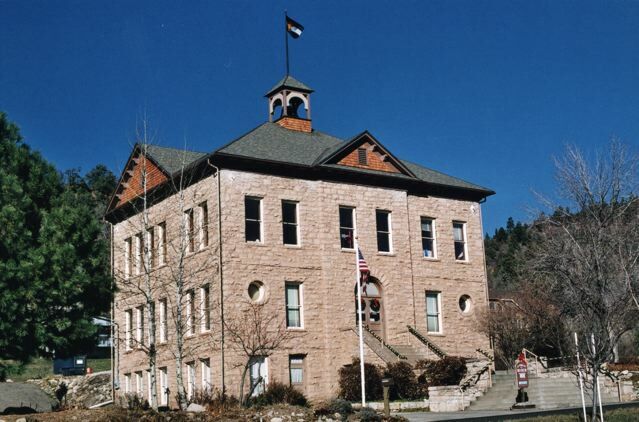 Animas Museum: Visit the Animas Museum, housed in the gorgeous 1904 Animas City School Building. The La Plata County Historical Society runs the local history museum, which features exhibits about Native American culture and the history of the Wild West. In November, the museum is open 10 a.m. to 4 p.m. Tuesday through Saturday. The museum is closed Thanksgiving Day. Durango Discovery Museum: The museum is an interactive science and discovery center that’s great for kids and adults alike. Located in the city’s former 1893 power plant at 1333 Camino Del Rio, the Durango Discovery Museum always has a host of cool (or gross) things to check out. Don’t miss the “Cockroach Laboratory” Tuesday afternoon. The museum will be closed Thanksgiving Day but is open 10 a.m. to 6 p.m. Monday through Saturday and noon to 5 p.m. Sunday. The first Sunday of each month (cough-this Sunday, Dec. 1-cough) is Pay-What-You-Wish Day at the museum. Winter Solstice Artisan’s Market: The Winter Solstice Artisan’s Market will be open 10 a.m. to 5 p.m. Tuesday through Saturday through Dec. 24 at the Durango Arts Center, 802 E. Second Ave. Shoppers can choose from handmade fine arts and crafts items made by more than 50 local and regional artists and artisans. Pick up local, one-of-a-kind gifts, including ceramics, jewelry, metal, textiles, glass, wood, notecards, ornaments, calendars, photography, paintings and drawings. Trivia Tuesday: Every Tuesday night is Trivia night at Ska Brewing Co., 225 Girard St. in Durango. Led by Ted Holteen, trivia night is 5:30-8 p.m. and pints are two-for-one. Bird Walk: Enjoy a walk along the Animas River trail while searching for and spotting birds of many different feathers. Meet at 9 a.m. Wednesday, Nov. 27, at For The Birds, 1560 E. Second Ave. near Rotary Park. The group will enjoy an informative bird-watching stroll along the river trail.